Mark MacLeod is a photographer of fine art as it pertains to the West. As a third generation Montanan, Mark feels blessed to live in a home state that offers a never ending source of inspiration and opportunity. Most of his work is stock/assignment which provides dramatic images that are available as original prints, posters and a variety of cards. As a native, he uses a discerning eye to capture the West as it truly is, allowing for detail and purity that will become part of a western legacy. He doesn't believe in contrived images, striving only for realism, "instead of portraying the West as fiction." Whether it's a pristine trout stream, a rugged rodeo arena or riding behind a dusty herd of cattle, Mark captures it and translates it into images. His commercial clients are impressive and cover a broad spectrum: American Express, U.S. Tobacco Company, Wrangler Jeans, HBO, Montana State University, Turner Broadcasting, J. Water Thompson Specialized Communications, Sports Illustrated, Gatorade, Spanish Peaks Brewing Company and Shiloh Sharps Rifle Manufacturing. Mark was the guest artist at Governor Mark Racicot's mansion from December 1996 through February 1997. He also exhibited at the Western Art Roundup in Miles city, Montana, the Montana Historical Museum, and the Western Design Conference in Cody, Wyoming. His work has been featured in numerous publications including American Cowboy, Big Sky Journal and Cowboys & Indians magazines. He confesses that much of his photography is done while sitting astride his leather office chair mounted on my "quad-pod," more commonly known as a saddle and horse. His work, however, isn't limited to what he can shoot on the ground. Mark is accomplished at aerial photography and has taken pictures for commercial clients as well as individuals. 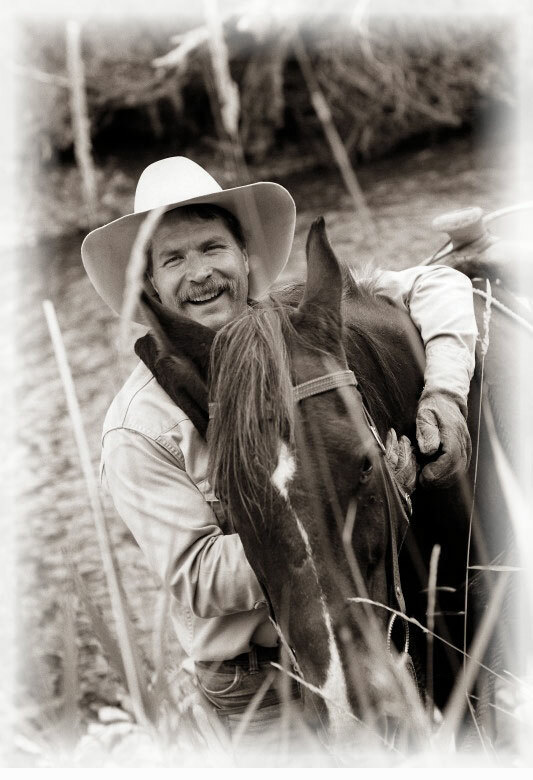 Mark has also been a licensed fly fishing guide in Montana since 1980. ©Copyright 2007. Highlander Photographics. All rights reserved.